haha. you are a funny man. Enjoy your Tango because after that comes Square Dance. Yeah I'll sign up for Philip's classes too! I always wanted to dance with John Travolta and Philip may be a close as I get!! Heh heh! 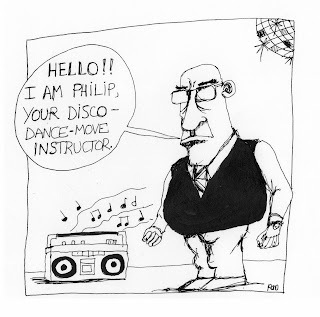 Philip is not exactly what I would expect, had I signed up for that class--well, at least not his outfit!! Love your unique spin on this week's theme. Wow, this guy seems serious, like John Houseman serious. Better get your moves right or you'll get wacked with a pointer. Funny one, my friend. I'm glad you posted this. I had no comment about that Che thug. I agree Ted, Che Guevarra was a controversial character...some loved him some hated him! Oh man, I used to dance. In fact I actually danced in disco houses, oh my. I was very young, around 17 and danced until I was 26. I know men who were really serious about dancing. I was always suspicious of them. I think Philip is a bit of a dancing dorky creep....possibly a science teacher Travolta wannabe! Well, my guess is that Philip's audience skews slightly older. In which case he'd be the perfect instructor! Possibly some of his clients are elderly and will be doing "disco-dance-moves" from their chairs. Which is totally fine! Bring on the Donna Summer! Love the vest and tie! can he do Gangnam style too? I'll sign up if he can teach me! This is what I've been missing out on; not signing into blogger all this time!!!! Great work man! I bet Philip has got the mooooooves!! I hope he has made a YouTube video, would love to see that!